Information Support System for Decommissioning Kursk Nuclear Power Plant – the project of Kursk Power Station and NEOLANT – received the Special Recognition Award “Sustaining Our Environment” and became a finalist in nomination “Innovation in Asset Lifecycle Information Management” on Be Inspired Awards by Bentley Systems. The project aimed to create an information system designed to keep a record of and store engineering and technical information and meet the information needs of Kursk NPP users involved in preparing and conducting the decommissioning of the power units. The system is scalable to meet future expansion needs and serves as the basis for creating a single information space for interaction among all organizations involved in the decommissioning efforts (design, engineering and research organizations, Rosenergoatom Concern and Rosatom State Corporation). To accomplish these objectives the primary functional subsystems have been implemented on the basis of Bentley products (data management subsystem, electronic archive subsystem and engineering models subsystem). All data that is accumulated and stored in each of the subsystems is interconnected by means of Bentley ProjectWise tools. One example of such data is design and engineering documentation that is linked with the object structure of the power units, which is in turn linked with 2D and 3D models of the engineering models subsystem. Such interconnections provide all user groups with a single interface for interacting with the system. The interface is based on navigation of 3D models created in Bentley MicroStation. Bentley solutions ensured effective interaction among various groups of specialists involved in creating the system. Such groups included specialists responsible for building the component (object) structure of power units, specialists tasked with creating an electronic archive of design, engineering, and operational documentation, as well as specialists tasked with modeling the power units and infrastructure of the nuclear power plant. The simplicity and versatility of the design process implemented with the help of Bentley MicroStation reduced the cost of creating the 3D engineering models that are the system's primary component. Solutions based on Bentley MicroStation used in combination with Bentley PlantSpace have made it possible to create all the necessary engineering models (the model of the Kursk NPP master plan with its distributed infrastructure, architectural and structural models of the main buildings of Kursk NPP, process models of power units, and detailed models of the nuclear reactors). By using the single software platform, we have been able to create all the necessary models in less time. In addition to substantial cost savings, the use of Bentley ProjectWise as a single software environment for developing the models collectively and interfacing them also ensured a high level of quality of the end product. The system thus created has already proven itself enough to merit the status as the primary system meeting the information needs of Kursk NPP users involved in decommissioning preparations. Considering the long-term decommissioning process (over 80 years) and the involvement of a large number of organizations, the system is expected to be used throughout the entire period of decommissioning and to be upscaled accordingly. The system based on Bentley solutions has been created to last a century. One of the engineering challenges encountered in designing the system was the need to build the component (object) structure of the nuclear power plant as a whole and of its individual power units. In other words, it involved building (as a structured list of objects with their characteristics) a detailed power plant configuration that includes such objects as, for example, structures within the industrial site as well as individual structural elements of the reactor and other equipment vital to the decommissioning process. Built-in tools of Bentley ProjectWise fully supported the object modeling of this configuration. Furthermore, the system was expected to perform certain applied functions to provide information support for the decommissioning process. For example, the advanced search tools of Bentley ProjectWise provided the system with the function of developing specifications for radioactive waste expected to form during the course of decommissioning. 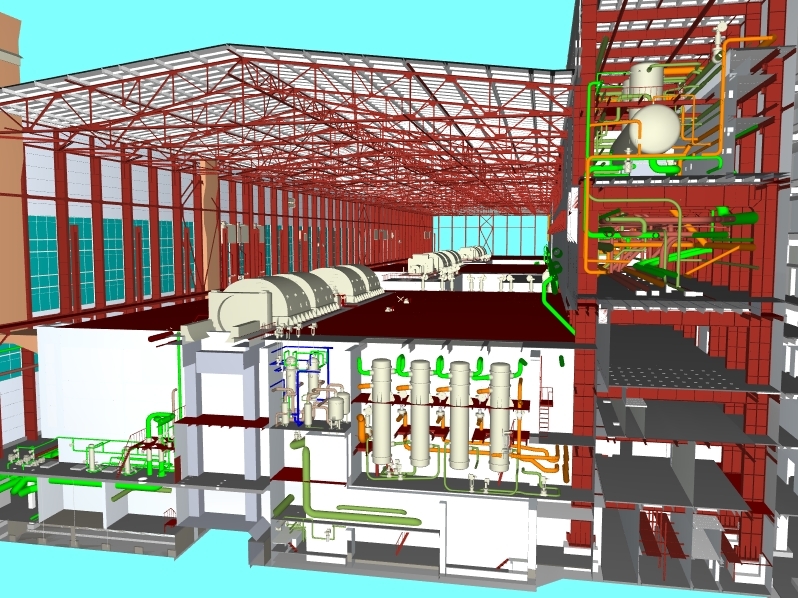 Instead of designing a new facility (or upgrading / retrofitting an existing one), Bentley solutions have been used to plan the final stage of the lifecycle (decommissioning stage) of a major industrial facility. There are no equivalents of this system in Russia. Some of the challenges encountered in creating the system included ensuring (i) collective work of authors responsible for the various subsystems, (ii) collective work of designers who created the 3D models by re-engineering the design and engineering documentation, and (iii) centralized record keeping and storage of all technical information that was obtained and generated. These problems were resolved by using Bentley ProjectWise software to create the system. The software served as both the basis on which the system was created and the underlying software used in operating the system.